GREAT PERFORMANCES: How familiar were you with “South Pacific” and the character of Emile de Becque before you worked on this Carnegie Hall concert? 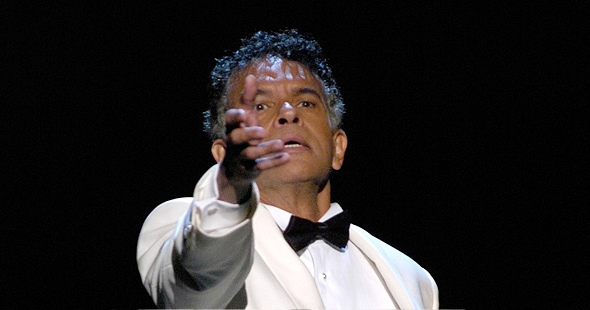 Brian Stokes Mitchell: I had never seen the musical on stage or a complete film version on television, but I knew bits and pieces of the story and had constructed the plot in my mind. But when I read the script I realized the plot I had imagined was completely wrong. I did know the music, though. That I was very familiar with. GP: Emile is usually played as a distinguished, somewhat distant man of the world who is very confident of himself. A nice contrast to the extroverted but insecure Nellie Forbush. But your Emile seemed much more approachable — a vulnerable, very human man with a lot to lose. How did you approach the character? BSM: At first I thought he was a rather uninteresting character. I knew he had usually been played by singers, not actors, and I didn’t think there was much depth there. But working on the piece, I realized that Emile is indeed vulnerable and, yes, he has a lot to lose. Then I found him an incredibly interesting man. Here he is alone in the world, raising two kids without a wife, and he meets this woman so unlike himself. It’s quite a challenge for him to act on his feelings for her. The stakes are high. GP: As with Emile in “South Pacific,” you’ve played several classic musical theater roles in revivals: Petruchio/Fred in “Kiss Me, Kate,” Cervantes/Don Quixote in “Man of La Mancha,” Sweeney Todd. These roles were created by famous actor-singers and their original performances are also considered classics. Does this intimidate you? BSM: Not at all. Like most of the audience, I never saw most of these famous performances. I’ve heard the recordings, but I don’t have this specific picture in my mind. I approach the character with my own point of view and don’t worry about how he was played in the past by such and such a performer. When I was preparing “Kiss Me, Kate,” I did go to the Museum of Broadcasting and watched an old kinescope of Alfred Drake doing the role on a television special. It was interesting, but I didn’t feel any need to try to copy him. I have one advantage over the great performers who created these classic roles: with the microphone, I can do some subtle things with the songs that may not have been possible when the actor had to fill the house with his voice. GP: You’ve done long runs on Broadway and short, limited runs as well. “South Pacific” was a one-night-only special event. Is it exciting to be part of such a gala happening or is it frustrating not getting to play the piece over a period of time? BSM: The answer is yes. It is very frustrating and yet it is thrilling at the same time. Usually I don’t feel comfortable with a character until I’ve played him before an audience for several performances. It is not until after three months of performing that I learn to discover what I call all the nooks and crannies of the person. With the Encores! concerts and special one-night programs, such as this one at Carnegie Hall, everything is special. You still have scripts in your hand, you’ve only worked with the orchestra briefly, and much of your energy is to get it right and not fall on your face. At the same time, it is a thrilling experience. In some ways it was the perfect way to do “South Pacific,” because no Broadway production could assemble that cast, that large orchestra, over and over again. GP: With your performance as Coalhouse Walker in “Ragtime,” you got to create a new, classic role in musical theater. Are you sent new material all the time? BSM: I am sometimes offered new scripts. I’m still looking for that great opportunity to create a new role, such as Coalhouse Walker. But such a prize role does not come often. When it does … that’s something very special. Interview by Thomas Hischak for GREAT PERFORMANCES Online conducted in April 2006.